Last night I scanned and uploaded several photos I took of Manila from 2000 to early 2002 with my point-and-shoot Canon Prima BF-800. Now, when I say “Manila,” I actually mean “Metro Manila,” the metropolitan area hugging Manila Bay, consisting of various cities and municipalities, from Valenzuela and Caloocan City to the north, to Parañaque and Muntinlupa, touching Laguna de Bay* to the south. Most of my time was spent in San Juan, where my family lived; Quezon City, where I studied; and Makati, where I worked. Later on I would move out of my parent’s house to be closer to my then-girlfriend in Parañaque (Long story for another day). I rarely went into the City of Manila itself, which was rather crowded and depressed. Full Photoset: Memories of Manila, 2000 to 2002. Pictured above is the service road just south of the Sucat Road – South Superhighway interchange. 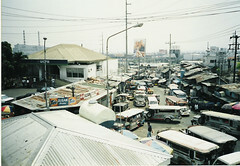 In the daytime, the street was used as a holding area for jeepneys plying the Highway-Kabihasnan route down Sucat Road. 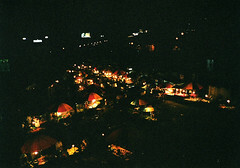 At night, fisherfolk and farmers from around the lake would pitch rainbow umbrellas and hawk fish, meat, and fresh produce. * Laguna de Bay: “Lake of Bay,” where “Bay” is pronounced “Ba-ih,” for the shoreside town of Ba’i. “Bay” was the archaic Spanish spelling. The spelling change has resulted in some confusion among the geographically inexperienced as to whether Laguna de Bay is a lake or a bay. Having no opening to the sea outside of its rivers and tributaries, it should correctly be classified as a lake. Some great photos there. It looks much cleaner than what I remember (I was there in ’93). My greatest impression of the city was riding in a jeepne where the driver was smoking a cigarette and singing to Achy Breaky Heart on the radio. The air was so dirty I couldn’t help but think that this guy must be taking days off of his life span for every hour he smoked and drove! I hope the coming trip will be a better experience (in Manilla that is). Walking outside the airport terminal is something I dread. Last time I felt like I was assaulted by mobs of Jeepne drivers. Your pics bring back memories. I know this area full well. My former home church is situated along Sucat Rd. I never liked driving along the Sucat Road – South Superhighway interchange. Nahuli na ako ng police dyan more than once. And the traffic jam there is always horrendous.